No, not that Mad Man, advertising executive Don Draper (actor John Hamm), suave, sophisticated, centre of culture, whom-women-swoon-at, Mad Man, but..
this Mad Man, aka Mad Dog of Midland, aka Adrian, who terrorises young children all the way from Midland to Perth with his crazy super-fast cycling in bare feet (drug free though eh Lance>? – cynical cyclist Ed), loud yelling, and extremely short shorts that do not cover his underwear-less posterior. I talked about how there was a definition of goodness implicit in the poster of and practices contained within, Guildford Grammar School. That how sending your boy to the school will make him – and the generations of men in your family after him – good men. Imagine my surprise therefore when I found out last week that one of the two Mad Men above went to Guildford Grammar School, and indeed has his name on the honour board. Fancy that?! 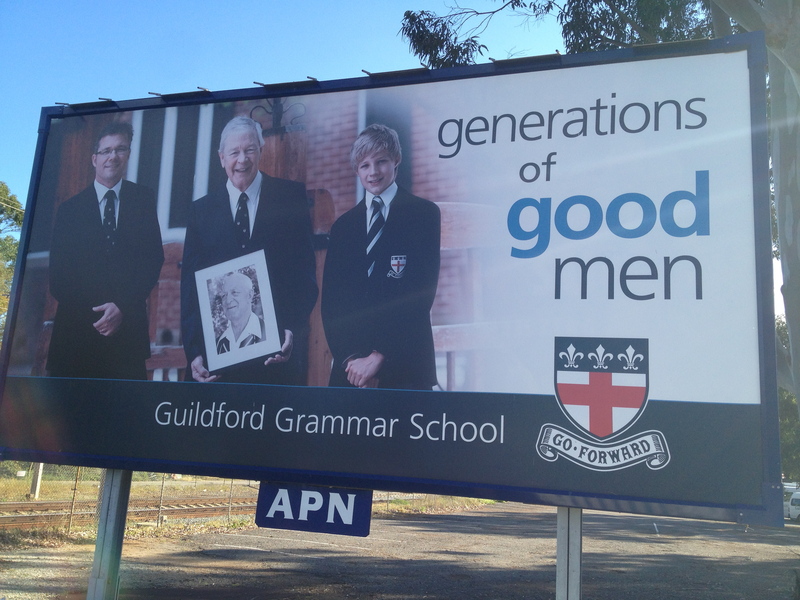 Now which of our Mad Men above do you think would have been a Guildford Grammar Boy? Which one fits the image that Guildford Grammar would like to project? Don or Adrian? Ok, you know it’s a trick question (series of trick questions – punctilious Ed), and the answer is Adrian. And perhaps he is the exception that proves the rule. But perhaps not! During our door knocking in Midland Damon and I met another slightly mad ex-Guildford Grammar man who had fallen through the cracks and would never be a poster boy for the school. He was slightly resentful of his educational experience (slightly!! – Ed), and blamed his dad for sending him off to boarding school from the farm. Chances are though, we’ll never see Mad Dog or this guy coming to a billboard near you. No, that’s reserved for the Don Drapers of society. Which is all how things should be. Which is what makes sense of the world. Unless of course you know the story behind the story of Don Draper. How, just like the nascent advertising juggernaut he is part of, Don is a sham, a front for someone other than who he claims to be. Our Don is living off a stolen identity, that fell into his lap fortuitously during WWII, and every day is a day closer to the day the suave sophisticate might be exposed for the run-of-the-mill John Doe he is. Which is not to say that the men on the billboard are not good men. But which is to say, that, if we really believe that only God knows the heart, the real person is always less than what the picture tells us, or perhaps, in the case of Mad Dog Adrian, something a little, and surprisingly, more. The Bible is the story of generations upon generations of Mad Men (and women – egalitarian Ed) whose madness is not to be found in the appearance, but in their rejection of their Creator, the one who truly knows who they are, who sees through their goodness and their badness to the madness that he alone can transform.